Not only will you be working towards your qualification, you will be building your future as an engineer. We will support you from your first day, guiding you through the programme and providing development opportunities. Take for example our tailored outward bound trip to Brathay in Ambleside, Cumbria, giving you the chance to work as a team with the apprentices in your year. This is your chance to learn from the best, so it’s not surprising that places on our apprenticeship schemes are very competitive. Our mechanical engineering apprenticeship is designed to train enthusiastic and self-motivated people. 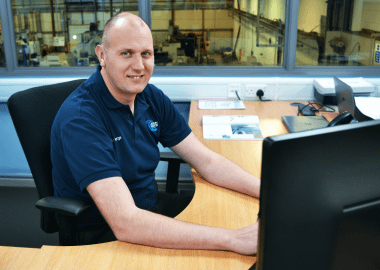 An apprenticeship with British Engines will give you experience in a range of engineering skills which could include CNC machining, assembly fitting, testing and maintenance. You may also have the opportunity to progress into design engineering, production, purchasing, planning and/or continuous improvement. A programme of hands on training which will continue throughout your apprenticeship. This is tailored to prepare you for the particular career you want to follow within the company. The PEO is a nationally recognised academic qualification, study takes place four days a week in college. (22 week course) A qualification you need to pass your apprenticeship. This builds on your Level 2 studies, and takes you up to Level 3. A qualification you need to pass your apprenticeship. The BTEC Level 3 in Mechanical Engineering is a nationally recognised academic qualification, study takes place one day a week in college (2 year course) A qualification you need to pass your apprenticeship. This is the first year of your enhanced training provided by our training partner TDR. You’ll learn first-hand about cutting edge engineering technologies, including visits to key companies and meeting and talking to world class engineers. A qualification you need to pass your apprenticeship. This is the second year of your enhanced training. It builds on your foundation year, introducing you to areas including Modern Machine, Machine Tool and Fixture Design, Metrology, Materials and Behavioural Safety. This is the third year of your enhanced training. It builds on your Foundation and Intermediate years, and prepares you for career in the advanced technical areas of engineering. 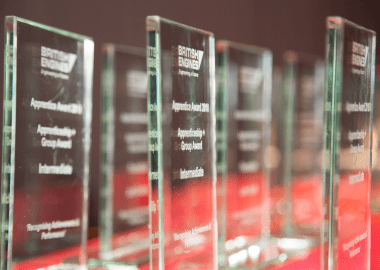 After successful completion of the British Engines Apprenticeship + programme, you may be able to progress towards achieving incorporated engineer status in your field of specialism. You may also, in future years, be in a good position to progress to chartered engineer status or higher level work. Subject to the academic courses you have taken during your apprenticeship, you have the opportunity to continue your academic studies towards a bachelors degree in Engineering (BEng) and even onto a masters in engineering (MEng). We will discuss these options with you and agree what the best course is for you. We also offer a commercial apprenticeship in business administration. Depending on the needs of the business, you will have the opportunity to work in a variety of commercial departments including finance, marketing, logistics, purchasing, ICT and/or human resources. The duration of a commercial apprenticeship with British Engines is around 18-24 months. As well as picking up a range of transferable skills during your time as an apprentice, you will be working towards a Business Administration NVQ Level 3. Applications are open throughout the year. Go to our vacancies page to view all available jobs. Year one combines vocational training, NVQ and BTEC qualifications with engineering skills and training to introduce you to your career. Year two continues the vocational training, NVQ, and BTEC study from year one. You also receive the first part of your Apprenticeship + training. This is called the foundation level. On successful completion of this year, you may have the choice to move onto the Higher Apprenticeship + courses in years three and four. Year three continues the vocational training and NVQ study. If you are starting Apprenticeship + intermediate in this year, you will begin a two year course of study for a HNC in Mechanical Engineering. Note: Apprenticeship + Intermediate / Advanced: You will start this in years three / four if we jointly think it is suitable. It combines training with additional studies for further qualifications. The programme is designed to provide you with the grounding you need to widen your career options, for example, production engineering and design with British Engines. Year four is the final year of your apprenticeship. You will finish your NVQ studies and your vocational training will focus on the area of work in which you’ll begin your career. If you were studying Apprenticeship + intermediate, you may now be studying on the Apprenticeship + advanced programme as well as studying the second year of your two year Higher National Certificate in Mechanical Engineering. Personal development for our employees is very important to British Engines. All of our apprentices will attend a residential course to build their skills in team building, problem solving, life skills and personal impact. apprentices now hold senior management positions.